We are having some new friends over for dinner this weekend, which is a nerve-wracking proposition. They hosted us a few weeks ago for a fantastic three course extravaganza, complete with a cheese board, fine china and crystal glassware (two different glasses — one for red wine, and one for white!). They are Italian, so their meal featured Italian style bread, pasta and meat. We are now grappling with the question of how to reciprocate. Since we’re British, should we serve a British style dinner? During my time in the UK, a British dinner often meant no dinner — just beer. The alternative would be a quintessential British dish, like bangers and mash. But I’m not sure that would go down well people who are used to light pasta dishes. 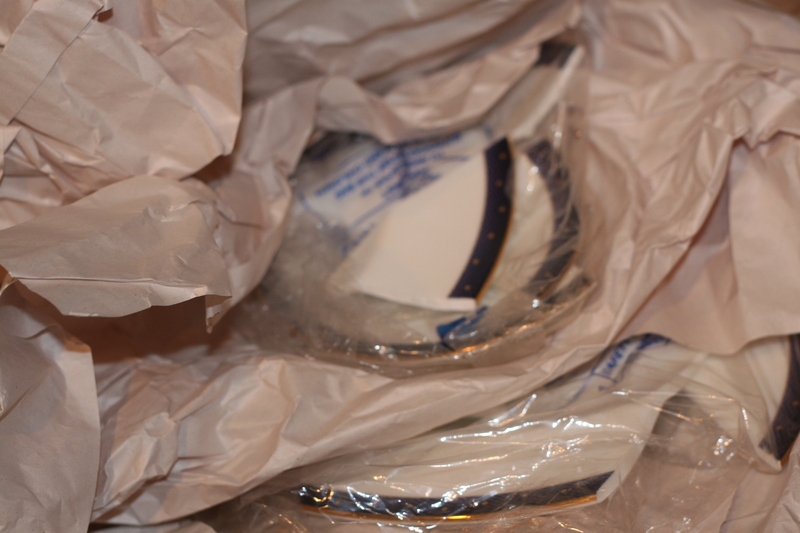 I suppose we should also break out the wedding china, which could be difficult, since several pieces didn’t survive the move from London. Inspired by “Sherlock Holmes,” which we saw last night and enjoyed, I decided to make a British tea staple today — the scone. 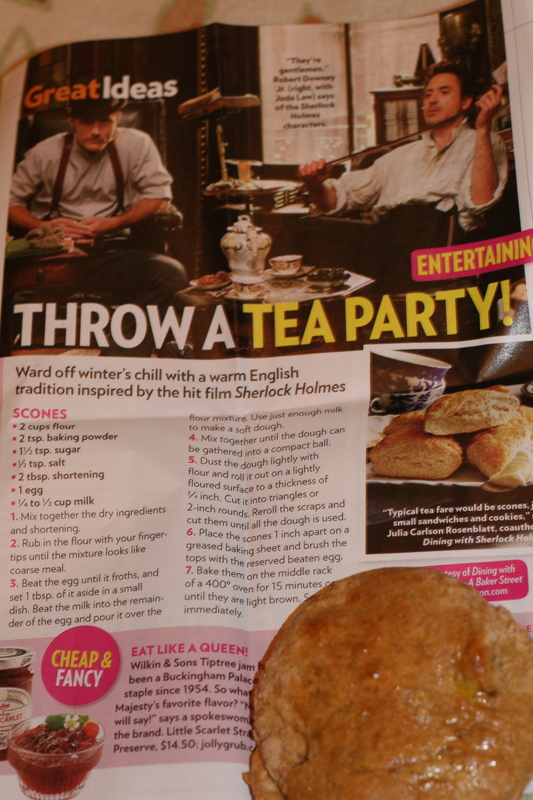 I used a recipe from People Magazine, which was excerpted from “Dining with Sherlock Holmes,” a book I really should buy. The baking was a fun rainy day activity for me and my daughter (seriously, when will this rain in Atlanta stop?). 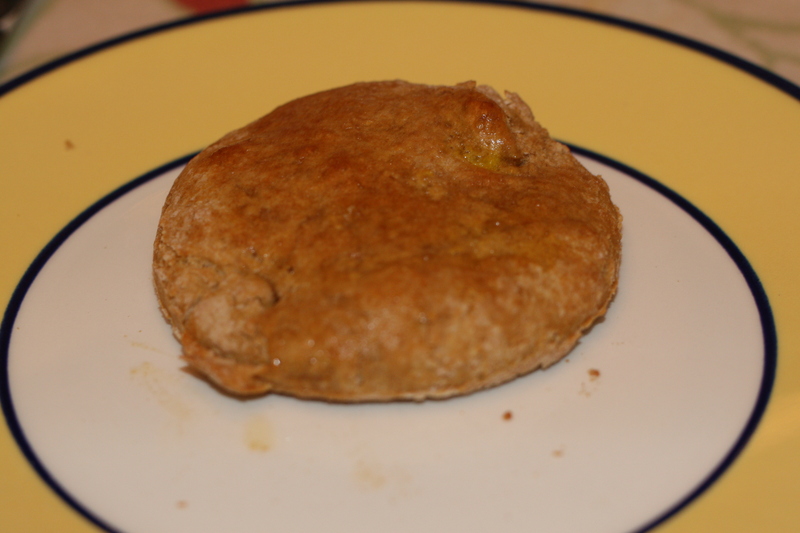 But unfortunately, because I forgot to add sugar, the end result tasted less like scones, and more like cardboard. The lack of sugar was not the only obstacle facing our scones. I question the Britishness of the recipe, since it calls for shortening. During my time living in the UK, I never came across shortening. In fact, my British mother in law, an ardent baker, had never heard of it. It was one of those products, like peanut butter and fat free salad dressing, that ex-pats had to bring over from the US. I suppose the author of the scone recipe wanted a low-fat alternative to butter, but maybe they would taste a bit more authentic, if fattening, with the butter. Or maybe the fact that I forgot the sugar — and, I should admit, the salt — accounted for the inauthentic taste. Still, they looked scone-like. And the act of eating scones as rain seeped down outside felt very British indeed. A woman from my neighborhood emailed the hundreds of families in the parents’ association the attached article from The New York Times. It quotes aid experts who say that often, in the wake of a disaster like the earthquake in Haiti, well-intentioned people send misguided aid. I can only assume that this email comes in response to a drive launched by someone else from the neighborhood last week. A woman organized a drive to send used shoes to Haiti. I wondered how they would get to shoes to the people who need them. It’s true that in the horrifying pictures on the news, survivors often seem to be without shoes. And I understand the helplessness you feel when watching the pictures of the desperate people in Haiti; you want to do something, but you don’t know what. The NYT article also says that formula isn’t necessary, because mothers would be better off breast feeding babies. But of course, there are so many orphans who don’t have the luxury of nursing. The positive side to all of this is how generous everyone is trying to be, in any way they can. 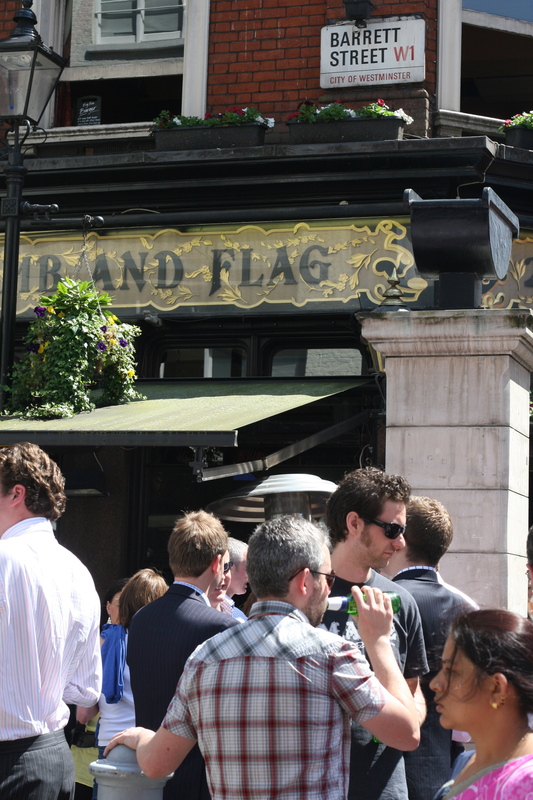 One phenomenon I miss most about London is the “leaving do.” These pub gatherings were fun, well attended, and most of all, frequent. Co-workers, friends, and even strangers always seemed to find a reason to congregate in pubs for lengthy drinking sessions — no matter how flimsy the excuse. Almost every week, there was something to toast: a colleague’s birthday; an engagement; a promotion; a debut; or, most, often, a departure. One place where I worked got so carried away with leaving drinks that the employees threw a pub celebration when a woman left one floor to take a job on another floor. The new position was with the same company, in the same building (and that building was not tall). Another woman was leaving for a break from the company, then found out at the last minute that she couldn’t attend her drinks celebration — but it went ahead anyway. The fact that the guest of honor wasn’t there didn’t dampen the mood, or make anyone question why they were there. I suppose the excuse made it easier for people with families to explain that they *had* to go to the pub (to say “goodbye” to someone, or “Happy Birthday,” or “I’ll miss you when you’re working on the third floor, while I’m still on the first”). Or maybe the reason for the gathering made justifying to oneself that one had been in the pub for five nights straight a bit better. Here in Atlanta, leaving parties don’t seem to happen with the same regularity as they did in London. When they do, they seem to be organized by management, rather than by the people. Perhaps I will try to organize a bar gathering of co-workers on the pretense that I am moving to another floor, and see what they say…. This is a heartwarming glimmer of hope in the midst of the carnage in Haiti — a toddler pulled out alive and unharmed from the rubble of ruined buildings. Watching this news report from Australia’s 7 News, and other interviews with aid workers from the US, the UK and beyond made me realize what an international impact the earthquake had — and how far-reaching the rescue effort is. As heartbreaking as the images are of the devastation in Haiti, I am glad to see how prominent the news coverage is. From the 13 year old girl who was pulled out of the rubble on CNN yesterday, to the baby Dr. Sanjay Gupta helped today, I haven’t been able to stop watching. I reassured to know that the world cares about the story. I am also impressed by how many people are trying to help. A group of women in my neigborhood are raising money to give to CARE International. They have friends who are deploying to Haiti to help in the rescue effort. So I’ll feel a little less helpless by giving money to them, the Red Cross, UNICEF, etc. I hope more aid gets there soon….